Backup Band in a Pedal! Jam out with bass and drums anytime with the DigiTech TRIO Band Creator effects pedal. TRIO automatically generates bass and drum backup by listening to and analyzing your chords and rhythm. Choose how your backup will sound from 7 music genres and 12 song styles per genre. Each genre has built-in guitar effects (defeatable) that help you nail that genre's sound. Whether you're practicing, writing new songs, or you just want to rock out, the DigiTech TRIO Band Creator pedal is the perfect resource to get you that whole band feel. Watch Don Carr Demo Video Watch Introduction Video Watch Jason Zerbin Demo Video Watch Winter NAMM 2015 Video The perfect tool for songwriters and practicing musicians Add an entire rhythm section to your groove in no time with the DigiTech TRIO Band Creator. Ask any musician at Sweetwater and you will hear that this intelligent and learning pedal is a valuable resource for music students, songwriters, and more. It's the perfect way to learn how to play with a band. The Tempo control lets you choose how fast or slow the rhythm section plays, and each instrument has its own level controls so you can create the perfect mix. The Control input lets you hook up DigiTech's optional FS3X footswitch for hands-free switching of song parts. 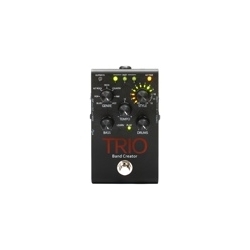 An 1/8" headphone output lets you practice silently with the DigiTech TRIO at any time of the day or night. Find the sound you want choosing from 7 music genres, each with 12 different styles Pedal learns up to 3 song parts that can be recalled on the fly Built in guitar effects appropriate to each genre make jamming easy Headphone out for silent practice Independent Bass and Drums volume controls let you get the perfect mix DigiTech's optional FS3X footswitch lets you switch song parts without letting go of your guitar Power supply included DigiTech's TRIO Band Creator pedal lets you rock out with the band anytime!